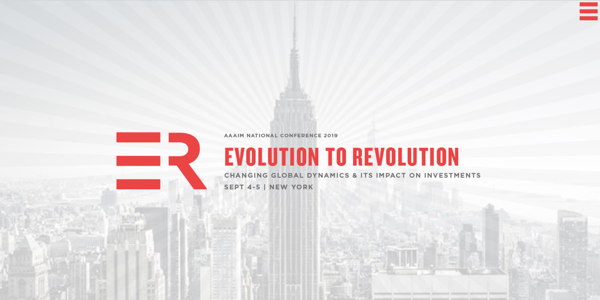 Register now for the AAAIM National Conference. Limited early-bird tickets are now available for a short period of time. Tickets sell out every year! 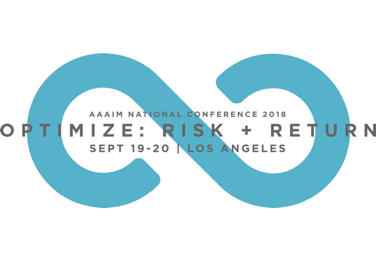 AAAIM and AAAIM-affiliate events across the country. Sign-in to your membership account for discounts to select events! 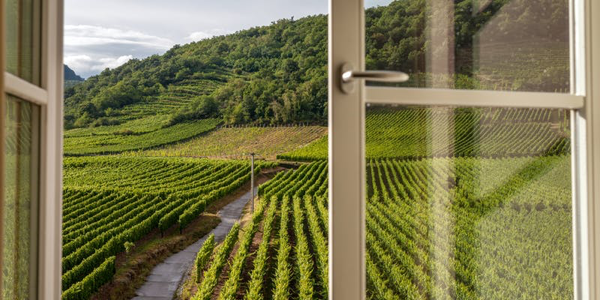 First Republic is hosting a 2-day Family Office Summit on Thursday, April 25th and Friday, April 26th at Silverado Resort in Napa, convening an intimate group of decision-makers from Family Offices. Interested parties must first e-mail Basant Kedia to confirm qualification for the event. We only have a few seats available, and we would like to save them to accommodate your referrals, as great people beget great people. 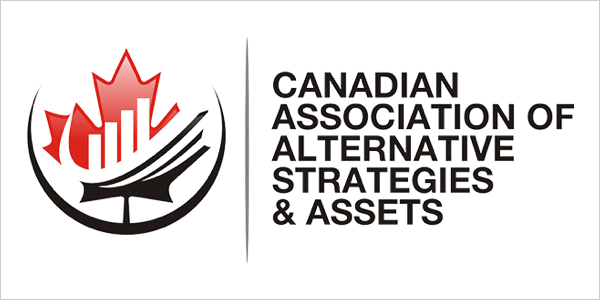 Alternative Investments - This program will focus on alternative investments, including a 21-point framework for private investing, a data driven view of emerging fund managers, a discussion on the future of real estate, and much more. Impact Investing - This program will focus on impact, including social impact investing, insights on family decision-making, and an action plan to combat climate change. Featured speakers include Renee Kaplan (current CEO of The Philanthropy Workshop, former CSO for Skoll Foundation, helped design the Giving Pledge), Lisa Snyder (MD, Family Legacy Strategies, Family Office Facilitator), Gerry Campbell (CEO of Frequency Group, author of Demand Generation), Dr. Jonathan Foley (Executive Director of Project Draw Down, world-renowned environmental scientist), Samir Kaji (SMD of First Republic, Emerging Manager Expert), and several more. Please note this is an invite-only event and space is extremely limited. Interested parties must first e-mail Basant Kedia to confirm qualification for the event. The CAASA Family Office Summit brings together speakers and participants from single and multi- family offices, investment dealers, Canadian and global investment management houses, and affiliated service providers. 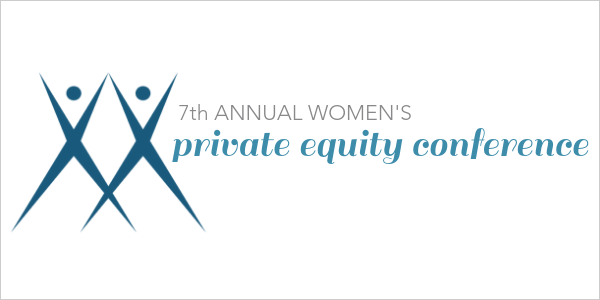 Panels and break-out sessions will focus on key issues facing family offices in Canada and elsewhere including structuring, legal & tax issues, IT and operational areas, and investments – including: hedge funds, CTAs, private equity, private lending, real estate, infrastructure, and crypto-assets/blockchain-related investments. All content is subject to Chatham House Rule. 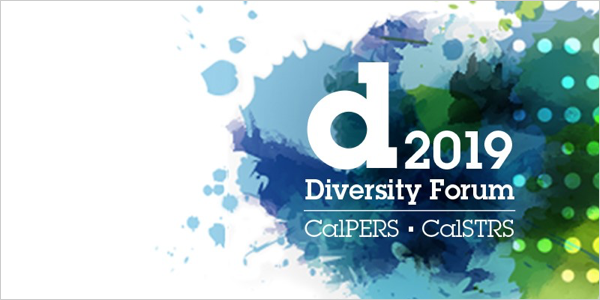 This event is co-hosted by the California Public Employees' Retirement System (CalPERS) and California State Teachers' Retirement System (CalSTRS). Consortium 2018 celebrated its 15th year with a sold-out gathering in New York with attendees from across the industry. The event's spirit, content and connectivity are stronger than ever. As Consortium continues to evolve, it remains a valuable industry resource for LPs, GPs and consultants. 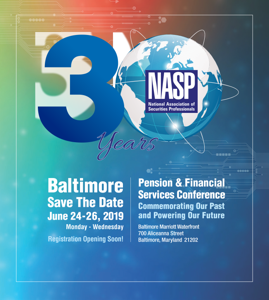 NASP's 30th Annual Conference will take place at the Baltimore Marriott Waterfront in Baltimore, Maryland. Committees to determine speakers, engage sponsors, and be intimately involved in the planning process. 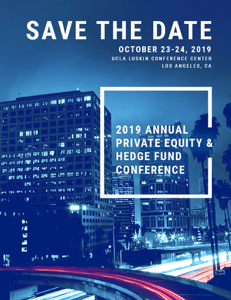 Join NAIC at UCLA's Luskin Conference Center to learn about the latest market trends while interacting with leading diverse fund managers, chief investment officers and other key stakeholders. This is a great opportunity to network with capital allocators representing over $1.5 trillion in assets to invest. 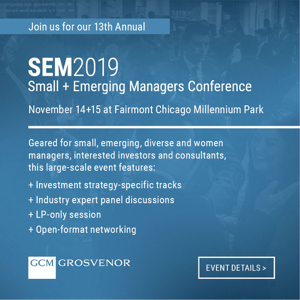 The GCM Grosvenor Small and Emerging Managers Conference's mission is to raise the visibility of small, emerging and diverse investment managers, while providing institutional investors access to these managers. 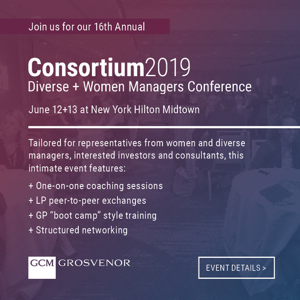 The Conference helps forge long-lasting relationships by facilitating connections between managers and investors in a welcoming community of talented industry colleagues. One of the longest-running events of its kind, 2018 marked the SEM Conference’s 12th year with another sell-out of over 750 attendees. Curious what an AAAIM event looks like? Take a look at our past events! 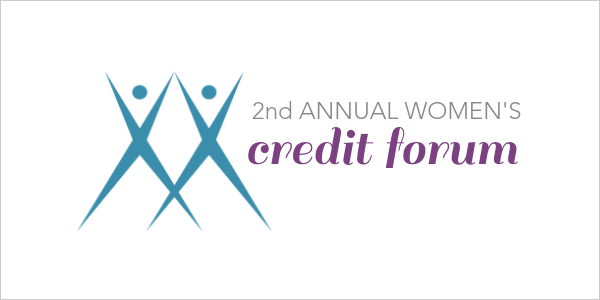 "Building Bridges: Accelerating Impact through Collaboration"